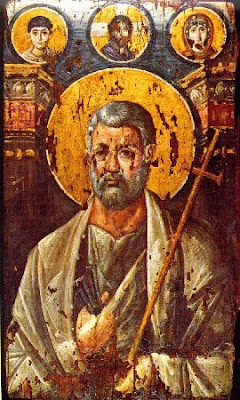 четвъртък, 26 юни 2008 г.
Saint Peter, encaustic icon, St. Catherine Monastery, Sinai, 6th century. Visible, above St. Peter, form left to right : St. Menas, Christ, and the Theotokos. 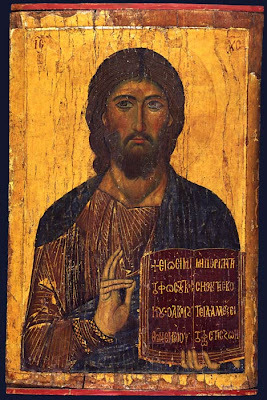 Here we see Christ as Pantokrator - "Ruler of All" holding a gospel in Imperial purple illumintated in gold. The Gospel reads - "I am the light of the world; the one who follows me would not walk in shadow, but enter the Light of Life". Christ raises his right hand in blessing. His robes are blue and Imperial purple, with the tunic hightlighted in gold. The background is subtle and luminous, in this ikon the halo merges softly with the gilded background. The face of Christ is well-drawn and the cheeks are brightly colored in red - giving the face an almost sun-burnt appearance. The nose is full and realistic - overall the image of Christ feels alive and full of energy. петък, 6 юни 2008 г. This is the famous Pantocrator (the Greek word for “Ruler of All”) icon at Hilandar Monastery on Mount Athos painted in 1260-1270. This icon was rendered in egg-tempera and shows the classical Byzantine iconographic influence of some of the best periods of early iconography, often portraying Christ in His Majesty and compassion. It has as well elements and stylization of other similar icons of Christ from the mid-13th century, especially in Macedonia and Serbia. Icons are always more than just humanistic and naturalistic art, for the human perspective is limited by its own limiting self-awareness that cannot become truly objective from an Eternal point of view. This objectivity is just what a true icon expresses, both the state of creation and who is being depicted at the very end of time, often involving some abstraction or non-naturalistic perspectives. 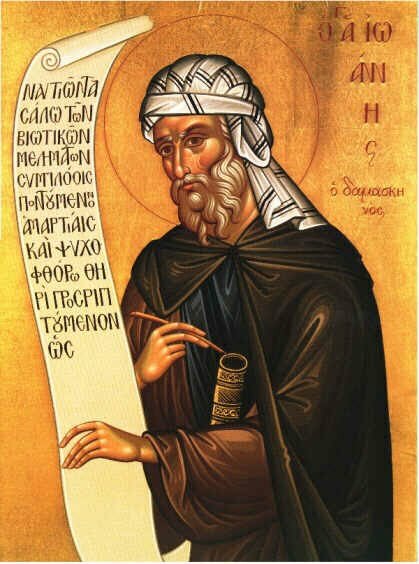 Thus Christ here has a long thin nose, wide set eyes which are open and aware, a pronounced brow, and a look of profound intentional insight into us, making us think about our own interior state now and in Eternity.